The long-awaited 787 has been in the news a lot lately. The first United 787 was recently delivered to United, so seeing more of these innovative new airplanes in North America will become more frequent. Japan Air Lines flies a 787 between Tokyo and Boston, and just this week, ANA launched 787 services on their Tokyo to Seattle route. I first got up close with a 787 in the summer of 2011 when I visited the EAA AirVenture show in Oshkosh. Then finally had the chance to fly the 787 on my trip to Japan this July. I booked Tokyo Haneda to Hiroshima return flights in economy with 12,000 United miles. This was the third ‘new aircraft’ for me on this trip after the Boeing 747-8i to Frankfurt and the Airbus 380 to Tokyo. I flew on the domestic configuration that ANA flies. Their initial layout was quite comfortable, but the low seat density was not a realistic long-term option for domestic use. The current layout has 9 seats across in economy, rather than the 8 in the original domestic and the current international configuration. Due to the short duration of the flight, I didn’t notice any difference in the reduced cabin pressure and higher humidity. The overhead bins were huge. The windows were quite large, and the electronic dimming controls were pretty cool. The lavatories were pretty high tech, as expected for a Japanese airline. The flexible wings and raked wing tips make for beautiful geometry both on the ground and in the air. Our departure gate was a bus gate, but ground boarding was kind of a bonus in order to view this brand new aircraft. Once on board, I was originally booked in an exit row seat. Thanks to the configuration change, I just had a standard window seat. I got nervous when I realized there was a change, and was concerned that they put they swapped out the 787. Thankfully that did not happen, so I didn’t bother to try to change my seat again. As I later discovered, the economy cabin was maybe 50 percent full, and I had a row to myself. This domestic configuration is pretty similar to how United is configuring this economy cabin with the exception of in seat AVOD and the extra legroom in the economy plus cabin. After takeoff, I was treated to some good views of Tokyo Bay, the city, and Mount Fuji in the distance. It was a pretty clear day, so sightseeing was nice throughout much of the flight. The windows are noticeably large. I took this photo with my iPhone 4 as a size reference. In flight service was simple, with beverages offered. All announcements were in both Japanese and English. In addition to the ‘cool’ features of the windows, I also wanted to explore the predictably high tech lavatories. Japanese take toilet technologies far beyond what most westerners are familiar with. Even on board, the toilets contain bidet and other functions builtin. Plus an automatic sensor to raise/lower the toilet cover and seat. Upon arrival at Hiroshima, I deplaned, and made my way for a bus into the city. I spent much of my time in Hiroshima exploring the very moving Peace Memorial Park. 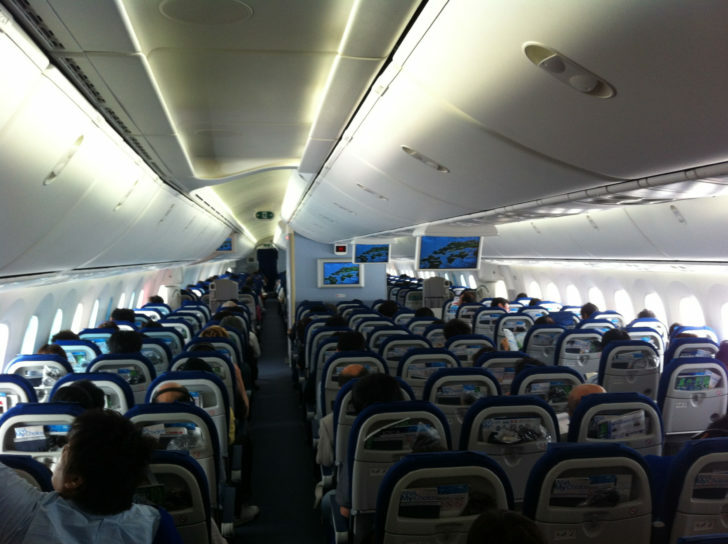 The return flight was pretty similar, lightly loaded on the same ‘new’ configuration domestic 787. The 787 is a technological marvel, and I’m excited for future opportunities to fly on this new bird. I think the next test is to take a long haul flight. To see how the reduced cabin pressure helps with jet lag. After arriving back at Haneda, I made a booking on a Limousine Bus that would take me to my long awaited stay at the Park Hyatt Tokyo. Boeing Rolls Out the ANA 787, and Flights Begin in September!